Trucks and buses drive past the area in Nairobi where Kenya's new Chinese-built rail line will cut through the capital's sprawling sanctuary for lions, giraffes and zebras, Aug. 4, 2015. Kenya's new Chinese-built rail line will cut through the capital's sprawling sanctuary for lions, giraffes and zebras, wildlife officials said last week, replacing the colonial-era railway known as the "Lunatic Express." Kenya's game parks and abundant wildlife draw tourists from across the globe but the government has said that must not stop the East African nation from building infrastructure to speed up development in a country where poverty remains rife. Under an agreement struck between wildlife officials and Kenya's government, the rail line will not alter the boundaries of the 117-sq-km (45-sq-mile) Nairobi National Park. Instead, it will be walled-off and raised above the ground so animals can safely pass underneath. "Ideally, there should be no transportation in a national park," said Richard Leakey, board chairman of the Kenyan Wildlife Service and a renowned conservationist. But, he said, the final plan was a "pragmatic" balance of wildlife and development concerns. "We can't say to the Nairobi resident: 'You have to sit in a traffic jam for the rest of your life,'" Leakey told reporters on the edge of the park. Money saved from routing the line through the park, rather than building in populated areas that would require land seizures, will go into an endowment for the park's upkeep, officials say, although the amount was not disclosed. 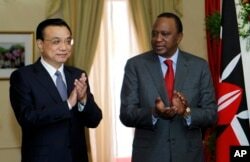 Chinese Premier Li Keqiang, left, and Kenya's President Uhuru Kenyatta applaud after the signing of the Standard Gauge Railway agreement with China at the State House in Nairobi, May 11, 2014. The $13.8 billion rail project, which began last December, will eventually link Kenya's Indian Ocean port of Mombasa to the capital Nairobi, then on to Uganda. It is part of a package of deals signed between Kenya and China in 2013. The existing narrow-gauge railway was built by the British at the turn of last century and was nicknamed the "Lunatic Express," in part because workers constructing it were eaten by lions. The old line does not cut through Nairobi's game park but it does pierce the Tsavo National Park. The standard-gauge line will be built in a fairly remote stretch of the park and Leakey said it was unlikely it would have any impact on the number of visitors to one of Nairobi's top attractions. "In a perverse way, because that bridge ... is an example that an African nation that cares for wildlife and has gone out of its way to consider the interests of wildlife, it will actually attract people who want to see it," he said.